What a privilege and pleasure to talk with Sheryl O’Loughlin. A candid interview where Sheryl shares both her highlights and the struggles. We begin talking about her history with Clif Bar and the winding journey that brought her to her current position as the CEO of REBBL. Sheryl talks about what it takes to get started in a new business and how to cultivate the skills and mindset to survive as we thrive. Sheryl talks about believing in leadership skills that are heart centered, and how she found the courage to bring her full self to the brands that she now works with. She reveals her strategies on how to stay afloat during the dark times and we discuss that when we finally let go of striving to be perfect, we are able to find and live in our truth and uncover our best selves. Sheryl candidly shares her experience of being judged by some of her “best” friends around her parenting skills and we talk about shame. An important conversation about how as women we often shame ourselves when we feel separate to others. It is a lovely and revealing part of the conversation as we talk about how we all have moments when we compare ourselves to those around us and all have parts of ourselves where we feel less than – this is the human condition. As a child, Sheryl O’Loughlin was best known for rushing everywhere and being too impatient to pour milk into a glass before drinking it. As an adult, Sheryl is no less eager. She served as the CEO of Clif Bar, where she introduced the world to Luna bars; she was the cofounder and CEO of Plum Organics; and she is currently CEO of REBBL super herb beverages. One of her favorite roles was mentoring budding entrepreneurs when she was the executive director at the Center for Entrepreneurial Studies at the Stanford Graduate School of Business. 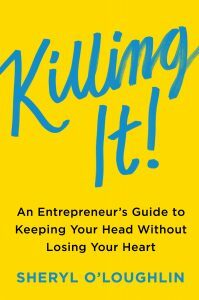 With her book, Sheryl is able to share her advice with a wider group of current and aspiring entrepreneurs all at once, which delights her because, well, it’s faster. And that means more time for drinking wine at her Santa Rosa home, and hanging out with her husband and two sons.